Patients who complain of pain in the Posterior Tibial Tendon region of the foot and ankle cause us immediate concern. Micro-tears in this important tendon cause inflammation, pain, and weakness. There is a wide range of severity with this condition. In the worst case scenario, the tendon will actually rupture–causing severe pain and a lengthy recovery. We have seen patients with inflamed tendons the size of hot dogs that require immediate casting. We have also seen patients with just a dull ache after walking around in old shoes. If you have foot pain in New York City, it’s best to see the experts at The Center for Podiatric Care and Sports Medicine, but here are five things you may not know about Posterior Tibial Tendon Dysfunction. 1. 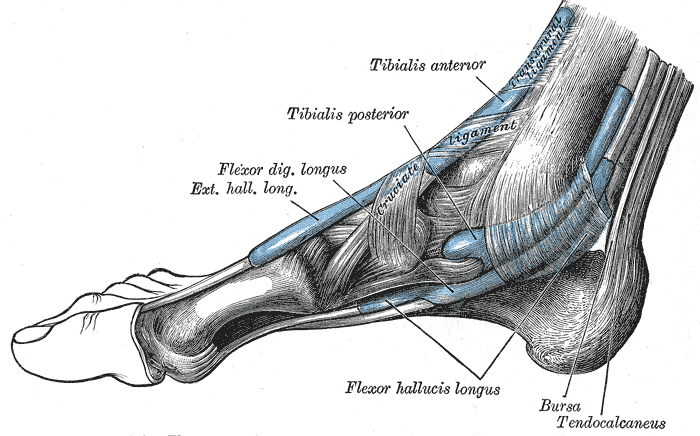 The Posterior Tibial Tendon is one of the most important tendons in the body. 2. Many pregnant women develop Posterior Tibial Tendonitis. Of course, pregnant women aren’t the only ones susceptible to Posterior Tibial Tendon Dysfunction. We also commonly see it in runners with flat feet; basketball, tennis, and soccer players; and dancers. We also see it in people who do a lot of standing and walking at work, but who also have some type of irregularity in their anatomy, such as diminished ankle and hip muscle performance. Other risk factors include age (over 40), obesity, diabetes, and hypertension. At The Center for Podiatric Care and Sports Medicine, we don’t just look at your feet; we look at the biomechanics of your entire body and assess areas that require correction or strengthening. 3. A widespread ache is the most common symptom. Nearly all patients report widespread aching that seems focused along the inside arch, particularly in the middle and extending up underneath the ankle joint, and even around the back of the heel. The aching is always there but worsens with activity, including walking and standing. Running can be very difficult. Swelling may or may not be obvious. When the arch collapses, the entire shape of the foot changes, with the heel tilting outward. With severe cases, a patient may not be able to do a single limb heel rise or move the foot from side to side. Dorsiflexion of the ankle may also be compromised. Sometimes an MRI is necessary to rule out the possibility of arthritis in the back of the foot, which has a common sort of ache. 4. Most cases are treated through conservative measures. – Take naproxen or ibuprofen 3x a day to keep swelling down. – Ice the injured tendon 2x a day to further reduce inflammation. – Get fitted for custom orthotics (if you’re not already) and wear them 24/7 in new, supportive sneakers–even in the house. – Avoid all activities except stationary biking, elliptical training, and swimming. Limit walking, especially uphill. Avoid running and sports. Continue this treatment for several months until the tenderness goes away. It is not uncommon for pain to last six months after treatment begins. Immobilization is the next level of treatment if the patient does not respond to these early measures. A short leg cast or walking boot may be used for six to eight weeks. Unfortunately, a cast causes other muscles of the leg to atrophy, and physical therapy will be needed when the cast or boot comes off. We are also equipped to perform ultrasound therapy on painful tendons. 5. There are many types of posterior tibial tendon surgery. In most cases, surgery is only considered when the pain is severe and has persisted more than six months. The type of surgery selected depends on where the tendonitis is centered and how much of the tendon has sustained damage. It is considered a complex surgery where more than one operation may be needed to obtain good results. – Gastrocnemius recession: The surgeon lengthens the calf muscles to help patients move the ankle up and down and prevent flatfoot development. However, patients may feel weak when pushing off or climbing stairs. Other complications may include nerve damage and chronic weakness. – Tenosynovectomy: The surgeon cleans away the inflamed tissue. This procedure is usually selected before the injury progresses to deformity, and is used to alleviate pain and swelling. The risks of this surgery are that the tendons will continue to degenerate, and the pain will return. – Tendon transfer: The surgeon removes the damaged tendon and replaces it with another tendon from the foot. The downside to this procedure is that some people may never run or return to competitive sports again. – Osteotomy: When the foot positioning has shifted, cutting and shifting the bones can recreate a normal foot shape again. Sometimes bone grafts are added to lengthen the outside of the foot or support the arch. Screws and plates hold the bones in place as they heal. Recovery can be slow from this procedure. – Fusion: When the tendon has ruptured or when arthritis is also present, the foot is too inflexible for standard bone cuts and tendon transfer treatments. The surgeon fuses the joints in the back of the foot to create a normal shape and eliminate pain. Damaged cartilage is removed, and the body should naturally glue the joints together to form a large bone structure that no longer hurts. The biggest risks are nonunion, continued pain, and wound infection. In general, the more severe the problem, the longer the recovery time. For some patients, it could take a year to get back to normal again, even with the best treatment. If you live near Manhattan or Westchester, New York, you can contact The Center for Podiatric Care and Sports Medicine for top-level care here.